in the creation this week ! I'm looking forward to seeing this. Also, what ever happened to the music project you were going around recording ridazz rapping? 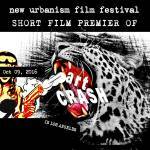 The Art Crash short film is now up on my website www.ckewer.com !